Star Demint would have traveled around the world to meet birth family but she only had to go 10 minutes to meet a half-brother. Demint was abandoned as an infant and later, adopted by her foster mother. Not long after beginning her search, Demint was told her birthmother had died, the one thing she didn’t want to hear. After more searching she ascertained that her mother died in New Orleans in 1976 and was buried in California. A call to the funeral home revealed that Demint had three brothers and two sisters. The sisters are not dealing well with the surprise of another sister but the brothers have been welcoming and supportive. The first brother she called told her another brother lived just 10 minutes from her. She impatiently went right over to her brother’s house. He said she looked so much like her mother he knew they were related when he saw her coming. Demint, who lives in St. Petersburg, Florida, has attended reunions with her new family in Tennessee and Iowa. Rachel Foster had not seen her sister, Judy Fenters, for 46 years. Rachel’s letter about searching for the Van Cleave family of ten siblings separated during the 1950s appeared in GRIT magazine and received 25 replies and a reunion. At age 12 in 1945 Rachel reported being abused and always felt the family blamed her for what happened next. She and two younger sisters were removed and made wards of the court. Older siblings had already left home. She thought they wanted nothing to do with her. Rachel, however, discovered it was she who was “lost.” Judy stayed in touch with everyone so Rachel was able to catch up. She points out that they were not close as children and doesn’t feel they will be now, but knowing they care is very important. Editors of GRIT encourage readers to share stories because sometimes dreams can come true. Contact GRIT, 1503 SW 42nd St, Topeka KS 66609-1265. I am a professional reunion planner, and rely on a wonderful researcher who averages finding 89% of all our classes! I am rarely involved in search. Yet I do glance at lost lists and search efforts to see if there is just one more way of tweaking it to find people. Weeks pass. I’m working on another rainy Saturday when I take a call from a classmate who knows the whereabouts of a missing person. Good. We always write down the “source” of our lead for missing classmates and she was “Amy Coggins.” How could I forget my obsession to find her! I introduced myself and told her the tracking I’d done which began with her birthfather. She was thrilled that I knew where he was. Through me they were put in touch and had their own reunion. Extremely good. Think about this story. What were the chances that I would search? Or the chances that I’d answer the call from Amy? Do you believe in “Angels?” I do now. 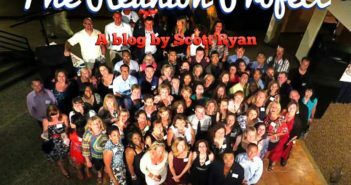 Kathe Murphy owns Classy Reunions in Sandpoint, ID; 208-263-1514; reunions@netw.com.